Photograph by Jeff HarrisDesign development and construction drawings. On the hunt for a vintage office chair. A total of 3000 sharpies were used in the sculpture. Do we ever really outgrow the thrill of a wall of unlimited markers begging to be scribbled on a massive blank canvas? As designers we will never stop reaching for pen and paper. We will never stop doodling, sketching, releasing the insanity and brilliance that makes us unique. When an idea strikes, it is a craving that needs to be immediately satisfied. Paper. Markers. The hand flies. We are and always will be "the art kids". Nikole Nelson Studios, a new york based collaborative of artists, designers, and makers, tackled the creation of the BFG communications reception for their new Soho, NYC office. Nelson developed the "art kids" concept after interviewing BFG’s creatives at their headquarters in South Carolina and New York. Researching and dissecting their individual design processes, she dove into their childhood and art kid dreams. When did it all start; and had it changed much? 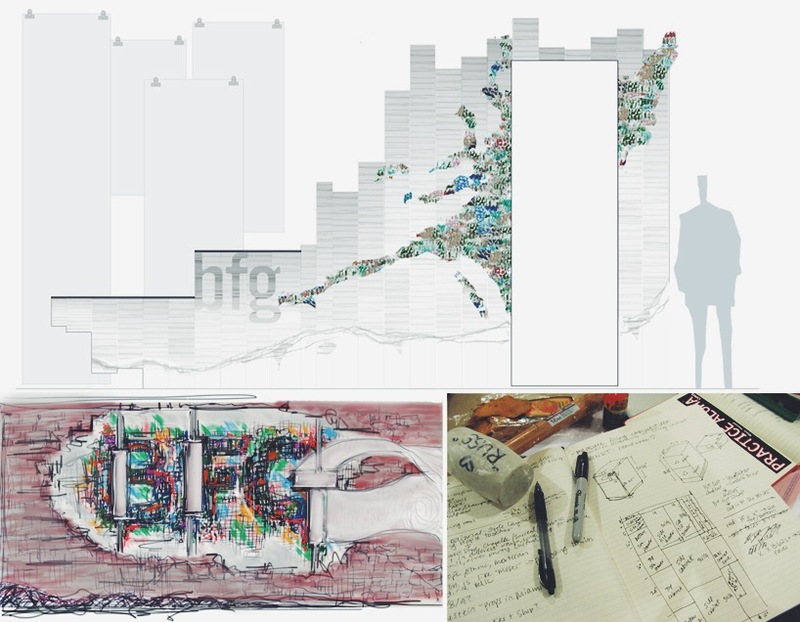 Nelson’s sculpture focuses on the diverse elements that make up the company – the 90 creative minds of BFG’s design team. What sparks the initial stage and layers within their work? It begins with the simplest of tools - a marker, paper - and becomes a global marketing platform for Warner Brothers, Captain Morgan, Coca Cola and beyond. Over 3000 sharpies, all functioning, created a wall of possibilities. Nelson used the individual marker colors to emulate pixels or mosaic tiles – each contributing to the visual movement of the sculpture. Stacks of carved paper climb the walls blending into a gorgeous gray scale. Plaster cast bases emulate the concrete streets of the city buzzing below. A roll of industrial butcher paper begs to be tagged with spur of the moment creative visions. It is art that functions, turning from installation to reception desk. An interactive piece that engages the staff and visitors to participate first hand in BFG’s creative process. Adding another layer of the personal, Nelson incorporated illustrations by BFG designer Ryan Kasal into the butcher paper roll and custom entry wallpaper. Written by Jennifer Tripp for Nikole Nelson Studios.